Social sharing is key here, as recommendations from real people are more trustworthy than recommendations from brands, in most cases and circumstances. Thus, if a reader/viewer/listener likes the content enough to recommend it to their friends/followers in social media, the producer of that content has a heightened opportunity for exposure, often to a net-new audience. 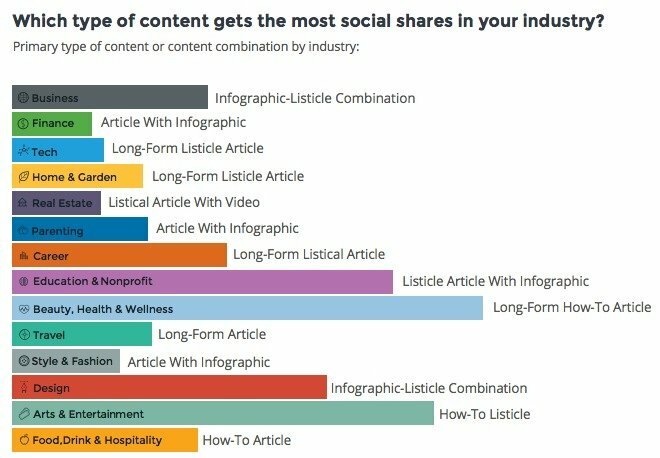 But what type of content is most likely to trigger that sharing behavior, and how does it vary by industry and social network? New content marketing research from ClearVoice answers those questions (and more). What Type of Content Marketing Works Best? In their study, ClearVoice analyzed more than 640,000 articles/blog posts/infographics/etc across 14 specific industries (fashion, business, arts, etc). The type of content marketing that works best in each industry varies considerably. Much more than I thought. For example, infographics are the most effective content format in more than one-third of the industries. Where Does Social Sharing Work in Each Industry? In the careers category, 73% of shares are on Facebook, with 23% on Linkedin. But in a category like beauty/health/wellness 76% of shares on are Pinterest, with Facebook at 23%, and Linkedin essentially zero. 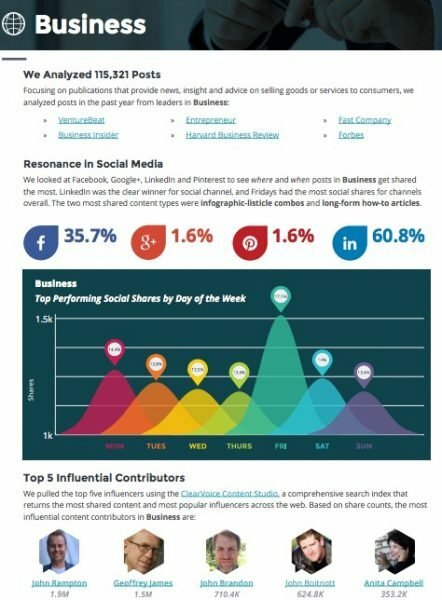 For each category, ClearVoice supplies a handy graphic that shows the top sharing tools, the best performing days of the week for social shares, and the top 5 category influencers (in terms of inducing social sharing). Helpful! Knowing where your content marketing consumers are likely to share, as well as what they prefer to share can help you craft a better content marketing editorial calendar. And the comparison chart ClearVoice provides showing most effective days of the week (sorted by industry) is worth a download all by itself.